As one of the country's largest acute hospitals, Beaumont has traditionally treated some 4,000 cancer patients each year and the disease has accounted for close to a quarter of all inpatient and day care admissions. Well over 100 beds are occupied by cancer patients at any one time. The hospital has an exceptionally good delivery record, with no significant waiting list for oncology services, despite high levels of activity, something recognised in its selection as one of the eight cancer centres in the National Cancer Control Program. In the future the range of cancer services available at Beaumont's campus will include radiotherapy, where a new radiation oncology unit is scheduled to open in early 2011. Beaumont's development as a cancer centre includes approval for new consultant posts, some of which are joint appointments with two other hospitals, Connolly Hospital in West Dublin and Our Lady of Lourdes Hospital in Drogheda. Currently its comprehensive patient-centred cancer service supports patients with specialist surgical, haematological oncology and medical oncology cancers on a single site. In addition, the centre offers new patients the enormous benefit of multidisciplinary consultation and care planning, supportive care and pain/symptom management. On a broader level, it provides patient and community education in cancer prevention, access to national and international clinical trials and professional education and liaison for community-based cancer control programmes. The main areas of expertise within the centre include both upper and lower gastrointestinal cancers and those of associated organs; breast cancer; urological cancer (including prostate, bladder, kidney, and testicular); lung cancer; haematological cancers (such as lymphoma and leukaemia); head and neck cancer; brain tumours; endocrine cancers; gynaecological cancers; sarcomas and skin cancers. Cancer care relies on the skills of many individuals, both medical and allied health professionals. The team at Beaumont comprises surgeons, physicians, diagnosticians and nursing care, as well as a variety of other specialists and support staff. The patients' medical details and diagnosis are discussed by the various members of the appropriate team at multidisciplinary meetings, cancer treatment plans are devised as a result. Well over 30 different distinct disciplines, plus a variety of support and administrative staff, are involved in the delivery of cancer services at Beaumont Hospital - ranging from cytopathologists, dermatologists and dietitians to neurosurgeons, radiation oncologists and radiographers to name but a few! Other support services such as occupational and physiotherapists, social workers, counsellors, psycho-oncologists, liaison nurses, etc seek to minimise the distress experienced by patients and their families during a difficult period. Professor Arnold Hill, Consultant Surgeon, in the new Breast Imaging Unit. 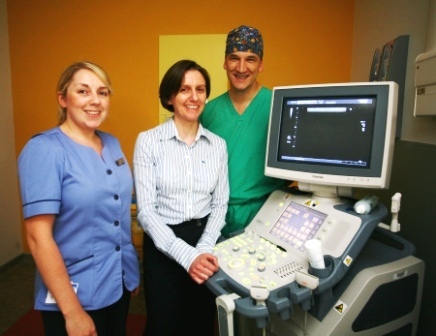 Beaumont's Symptomatic Breast Unit serves north county Dublin and the north Leinster region. It sees up to 5,000 out patients with various breast problems and treats over 200 breast cancers per year. Six breast surgeons run eight triple assessment clinics each week and there are four clinics seeing return patients and non-urgent new referrals. The triple assessment clinic involves clinical examination by a physician and, wherever indicated, radiological examination and tissue biopsy. As part of this service, a new Breast Imaging Unit was opened in 2009 to allow for rapid diagnosis of patients in a setting that is both appropriate and accessible. Reflecting the importance of teamwork in the development of its services, Beaumont has recently adopted a medical consultation system, Telesynergy, along with each of the other cancer centres. Developed by the National Institute of Health in Washington DC, Telesynergy makes use of cameras, microscopes, audio systems and other devices to enable doctors and other healthcare professionals to collaborate from several locations.